Ocean Front - Ocean fall is a spacious two bedroom with one king bed in the downstairs bedroom and one queen in the upstairs bedroom. The house has a fully stocked kitchen, a nice living room with a flatscreen TV and a fireplace. The home has beautiful panoramic views of the ocean and a deck with a hot tub overlooking the beach! We stayed at the Ocean Fall house 4 nights in February. Beautiful home with views just as advertised. Very comfortable beds. Great kitchen. The staff at Bodega Bay Escapes is wonderful. On our last night there was a storm and blackout in the whole area. Luckily the gas fireplace still worked, with plenty of extra blankets available. We would definitely return. This is a gorgeous house that doesn’t feel like a rental. It’s spotless and beautifully designed. And it doesn’ Have that smell that says you’re staying in a house that a thousand other people have stayed in before you. It’s tastefully decorated with a fully stocked kitchen. I plan on coming back here again and again. Location, amenities, views exactly as described! Beautiful home with beautiful view.Furnished with everything needed for a exceptional pampered stay. Was spotless upon arrival. This was our 2nd time here.wonderful experience. Very cozy, excellent views. We arrived Sunday afternoon and the spa required maintenance, which was completed Monday, which required extra chemicals. Spa maintenance person that because of the extra chemicals, not to use it until Tuesday. We prepared steaks for dinner and there were no steak knives. Other than things that were out of any ones control, great experience, we will try to return again. Plan to return next year, same time, same place. We had the best Christmas week ever with our regular stay at Ocean Fall! Thank you to Jessica & Pam for always taking care of us & being so accommodating! It is because of them, that we continue to use Bodega Bay Escapes for our rental homes on the Sonoma Coast! Perfect house for us. Great location, wonderful view. Very well equipped kitchen. Perfect vacation home. Loved everything about this house. Location, view, sound of waves and amenities. Hot tub is perfect on the deck. I wished it had washer/dryer. Another great weekend thanks to the great staff at Bodega Bay Escapes. I have been coming to Bodega Bay my entire life. Ocean Fall location over looking Wrights Beach brought back many fond childhood memories. Both this home and views are spectacular. We can't wait to return. Great location, out of town a bit so it’s quiet at night. Amazing views. The House was well equipped. Beautiful Property and Great Customer Service! Ocean Fall is a stunning and relaxing home for a vacation for 4 people. The tremendous views, the hot tub on the deck with the view, and the living room fireplace provided just the ambiance we wanted. The home was very clean, and the front garden was lovely. We enjoyed a lunch at Hog Island Oyster Farm (SO much fun), and a remarkable dinner at Terrapin Creek Cafe (has a Michelin star). Pam and the staff at Bodega Bay Escapes are outstanding and go out of their way to make sure their guests are very well taken care of! Second time stay at this oceanfront cottage well equipped for our family of four. Our boys played in the hot tub outside on the deck while we partook of the shade underneath the large umbrella provided laying on cushioned chaises viewing the immense ocean view and beach before us. This home is well located to several delicious dining experiences from picnic table to cloth tabled restaurants where seafood is abundantly available. We shall return. The home is in a great location with spectacular views. It is furnished with everything you need. We hear a larger bed is coming so that will make it even better. We may come back!! Beautiful view and very nice home to vacation and relax in. Love the spa in the evenings on the patio with the sound of the ocean. We will definitely be coming back!! We loved this house...loved the windows with the most beautiful view ever of Wrights Beach and the ocean, loved the deck, loved the hot tub, loved the kitchen!! The house was very clean and tastefully decorated too! The property management team was super easy to work with and very friendly and helpful. Ocean Fall has become our second home and we don't want to talk about all the great things about it too much so no one finds out special place on the Sonoma Coast. As always, Pam, Jennifer & Jessica are the best and have been taking care of us in all our rentals! They make all of our trips so special and are so attentive to our needs! We will not use any other property management team but Bodega Bay Escapes. We have used another management team in town and was not happy with their services. Thank you girls for making our Christmas week the best!! Ocean Falls was perfect for 2 couples. This home has 2 master suites on opposite sides of the home. Beautiful views and great places to sit and enjoy the surf. Everything you need is here in this home. It was great! Nice and relaxing! We had a lovely few days at Ocean Fall. The house was tastefully and beautifully decorated, but that truly paled in comparison to the view: SECOND TO NONE. The mattress in the master bedroom was wonderful, making for a perfect night's sleep. Location was ok, fairly close to markets and the towns of Bodega Bay and Jenner. The hot tub was wonderful and clean. On the down side, the house did have ants, but the property team was very communicative and sent us some ant traps. Internet was slow (which is great if you are solely on vacation to disconnect, but bad if you are trying to work remotely). The deck was not enclosed, but this was only an issue since we have toddlers. I would definitely stay here again, especially as my daughters get a bit older, as the stairs and deck will not be an issue whatsoever at that point. This felt like a true getaway, and we were charmed by the home and ocean. We rented this home for a long weekend and it couldn't have been more perfect. The pictures do not do it justice. You are perched above the most beautiful panoramic views of the Pacific, with the calming sound of waves in the background. The home is stocked with high quality linens and essentials, clean, well maintained, comfortable and private. Bodega Bay Escapes was so nice to work with, friendly and accommodating from the first inquiry through check-out. We enjoyed long walks on the beach, reading on the sunny and private deck, going to Bodega Bay town for fish and chips, and cooking up seafood in the well stocked kitchen. Having stayed at Ocean Fall, there were no surprises but anticipation of a well kept cozy home with an unobstructed panoramic view of the vast Pacific Ocean including a sandy beach to watch the waves crash upon. There is a short walk toward the water tower, across a narrow path near an unbusy Highway 1, down a coastal road flanked by wild flowers and grasses to a zig zag dirt path down to Wrights Beach where we searched for sea shells and tusselled with our kite that instantly flew to the end of its string in moments. Dined at both fine and funky eateries, Jenner was a mere 8 minutes away to enjoy River's Edge with a view of the Russian River and ocean simultaneously. Fishtarian was our first stop for fresh fish and chips. Former Duck club now Sonoma Coast Kitchen at the golf course is a must dining experience with a gracious engaging staff. Not to miss, Freestone's Wild Flour Bread with delicious fresh scones and strong coffee beverages and Spud Point Crab Company's right off the boat crab sandwiches. Our 7 year old grandson enjoyed himself thoroughly in the hot tub even with the cool coast air and caught him pondering the emensity of the Pacific Ocean and the birds catching updrafts right over his head. The washer and dryer came in handy to lessen the laundry loads when arriving back home as well. My tub loving disabled son was easy to wash in the ample master shower with 3 choices of shower heads. So yes, this trip was a relaxing fun diversion from our busy city lives. Ocean Fall is my new favorite of the Cliff Drive vacation homes. Located in the middle of cliff Drive for 180 degree ocean views. Beautiful home (neither rustic nor modern-- best of both)with a smart floor plan. Has it all-- fireplace, hot tub, spa like master bath attached to ocean view master bedroom. The guest suite is built for a person of small stature (thankfully my friend is short). conveniently located on the other end of the house for the privacy of everyone. The charcoal BBQ worked, but it's time to replace that. Can't imagine a metal BBQ would last long out on the deck in the ocean air. I would probably keep this in the garage. It's a plus that there is a washer and dryer. Great for week long stays. The house was great. Already booking my return! Thanks! We desperately needed to get away. This was absolutely perfect. It was just what we needed and perfect for our family of 4. This is a perfect house for two couples. Cozy, nicely appointed, bathrooms really nice especially the master. Views unparalleled. Can't wait to come back! It's nearly impossible to tear yourself away from the view! The expansive view, from inside the house and outside, is the most striking feature of the house. It's great from the giant picture windows in the main room and framed from the bedroom. The entry courtyard charmed us every time we returned to the house. The kitchen is well-stocked, if not well-organized, with quality appliances and equipment. It was a pleasure to prepare meals there. Both bathrooms were quite nice. The shower in the master bath was delightful, though the steam shower is no longer functional. We were disappointed that the fireplace was out of order, but it will be a lovely touch when working. It felt like the house was recently equipped and some things are still missing -- like cushions for the deck chairs, extra blankets, comfortable pillows, reading light in the living room. But none of those kept us from having a very comfortable and relaxing stay! What a place. Really enjoyed it with my family. Only complaint was the television didn't work but who needs TV when you have THAT view. Awesome place. Would like to stay again. Relaxing!!! Nothing like a little salt air and the sound of the ocean to rejuvenate the sole. Just wished the fireplace was working! Incredible location with breath-taking views! It was hard to leave...the house is a perfect vacation get-away with all the amenities including bay view windows and sun deck that expose you to miles of the pacific ocean and coast line. This was a beautiful home. Very comfortable. Only disappointed the fire place wasn't working and we had an Ant problem. I just feel like for the money, we should be able to check out like a hotel. While we are busy packing, it takes our last precious morning to strip sheets, vacuum, wipe down sinks etc. 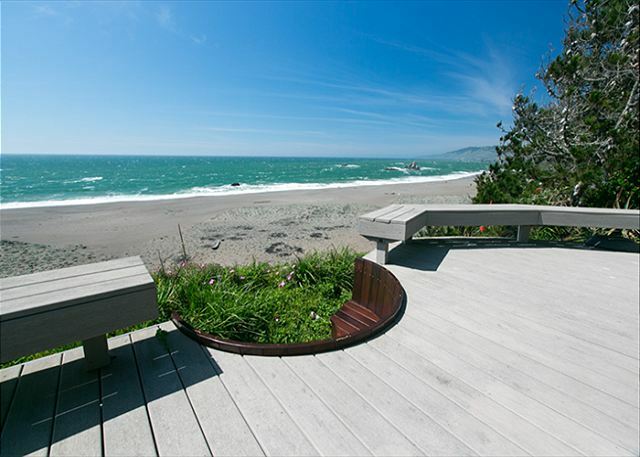 Best Beach Front Home on the Sonoma Coast! Words cannot describe our stay at Ocean Fall. We have only been home one day and oh how we wish we owned this stunning beachfront home!! I have been renting homes on the Sonoma Coast since the 1980's and our kids grew up spending time here. We only rent our homes from the staff at Bodega Bay Escapes because they are professional and go out of their way to make your stay comfortable! I would not use any other property management in the area unless it was Bodega Bay Escapes! Jessica, thank you for helping us you are the best! The home is the best home home that we have rented to date. It is beautiful, open, comfy, cozy, warm, oceanfront, has great amenities along with everything that helped to make our Christmas & New Year's stay the best holiday that we ever had! The home was perfect, very clean, has a very positive feel along with feeling that we were safe. It's a feel good home! We watched whales spouting water and dolphins playing close to the shore. We walked the beach and found beautiful shells to bring home along with buying great coffee, latte's in the mornings from Captain Davey's Coffee & fresh prawns for our Christmas Eve dinner from Lucas Wharf! Fantastic! We saw a beautiful rainbow in front of the house looking out from the deck our first day that that helped to set the entire trip off on a positive note! 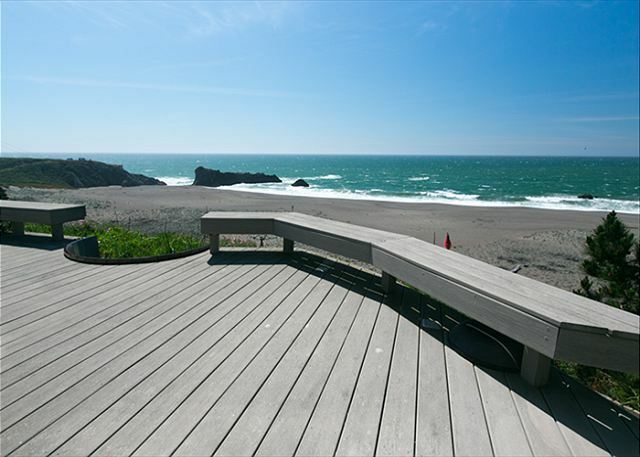 We cannot recommend this property enough to people who want to experience everything that the Sonoma Coast has to offer! We will continue to rent this home this year and hopefully be back during the holidays!! Bodega Bay is not a vacation get-a-away for us anymore, but our second home!!! This is a great property and a great location. The view is astounding everyday all day and the house is well appointed and in great shape. The staff at Bodega Bay Escapes were very helpful and responsive. We'll definitely be back. Delightful, loved the views, gourmet kitchen, 10 minute walk to the beach, privacy with bedrooms far apart and great deck with a hot tub my grandson almost lived in. Ocean Fall exceeded our expectations! The location was perfect, and the view was wonderful. The home is very well finished and furnished. There wasn't one thing we needed that wasn't available for us. We loved it so much we cancelled our reservation in Sonoma to stay an extra night. We will definitely return. This is our second trip staying in Ocean Fall since December/January 2015/2016 & we have to decide whether we want to give away our secret hideaway that we love so much! The home is so comfy, cozy & is the best that we have rented from Bodega Bay Escapes. It has such a positive feel & has everything we need to make our stay the best! We watched female whales with their pups swim, play & feed four days out of our 5 day stay from our deck & one morning around 7:30am we watched two dolphins swim and play so gracefully. We have been coming to Bodega Bay since the 1980's & only rent our homes from Bodega Bay Escapes. We love the girls in the office who help make our trip special! Thank you to Jennifer for taking care of us during this trip and who had the hot tub heated & waiting for us! The only downfall of Ocean Fall is that we had to leave so soon! We will be back later this year!!! See you soon Ocean Fall & Thanks Ladies!! I've stayed in several homes on Cliff Avenue and Ocean Fall was the best! Having rented vacation homes in Bodega Bay for decades, we love the homes above Wright's Beach the best. Homes around the bay are also great, but you can't beat Cliff Avenue. The staff/owners at Bodega Bay Escapes are above top notch! See you again soon! As always, big thanks! THIS HOME IS BETTER THAN THE PICTURES DEPICT. MY HUSBAND AND I RUN OVER AT THE LAST MINUTE FOR A QUICK 3 DAY WEEKEND AND WERE EXTREMELY HAPPY WITH OUR CHOICE. BEAUTIFUL HOME WITH GREAT VIEWS AND ALL CONVENIENCES WERE PROVIDED. WE HAVE ALWAYS STAYED IN HARBOR HOMES BUT KNOW NOW WHAT WE HAVE BEEN MISSING! WE WILL BE BACK. "BEST" Bodega getaway we've ever had. Book it today! This home is a luxury retreat right on the oceanfront, our favorite home to date. I hear they are bringing in a king-size bed into the master suite, we'll be back. Really excellent place. Only drawback was last year we had access to washer and dryer and this year the area was locked off. Clean. Beautiful home. Saw whale swim by first night. We really enjoyed our week at Ocean Fall, you can't beat the view!! The home is a little small so be prepared for that. The kitchen was very well stocked, you will want to bring your own spices. The home was very clean, loved the master shower and the bed, so comfy...We would definitely stay here again. Beautiful views and a great location. Desperately needs a new barbeque. Beautiful location but too far from town for us. Only problems: too many remotes gadgets, took us forever to figure out TV. Also no WiFi. Don't come here if you need to do any work. Overall, a good experience. We have rented this place 4 mos before and there was a problem with the television set-up and the dishwasher. Same thing happened again this time. It was frustrating to experience again, as who wants to be in a house on vacation where the tv and the dishwasher do not work. The rental company reacted to the complaints quickly and professionally, and in the case of the tv (but not the dishwasher), got it running. Given the prior history of these issues, I believe, however, these were problems that should have been known and corrected before our visit. Pros: The strength of this property is clearly the view. The decor is updated and fresh, the view from the deck and living room/kitchen is one of the best in Bodega Bay. Cons: The bed in the master is small for some reason-like a full or very small Queen. I've stayed twice and both times there was an ant problem. This last visit I would consider it significant. If spending nearly $500/night, you shouldn't have to spend several hours over the course of the stay spraying ants and cleaning up. Only other knock is the linens had a musty smell. I assume the cleaning folks just rushed it prior to this last stay since it was not an issue the first time we visited. If you are looking for a show-stopping view, this really is your place. Loved the house, however, showing from the pictures I thought we would be able to walk out on the beach, I was not aware there was a big drop off with no beach access. Also the fireplace was out of service so we couldn't use that and the lights out on the patio were all out as well except for one. The house was very comfy and the views were beautiful. Loved the deck as well. Great views. I basically lived in the spa with wine and a sunset. Beautiful. House very clean and the house was stocked with all of the essentials. The only complaints I have are the location and the ants. Its farther out from town than I thought. Only about 6 miles but 6 miles on a windy cliff road after a wine tasting is not good. I brought my dog and put his food and water out. By morning there were ants all over it. They also got into another bag of dog food I had in the master bedroom closet, my gym bag, and my dogs little bag. Had to throw both of them away. Ok, so I thought it was only because of the food. Nope. We threw some wet towels on the bedroom floor. Once I moved the towels there were more ants! Frustrating! Anyway besides that it was a nice place to stay. Beautiful home, gorgeous view, enjoyed the hot tub, the only drawback was we couldn't watch the SF Giants at night cause their directv did not get CSNbay area, I know that should be inconsequential but the Giants were on a hot streak and for what we paid they should have had this basic directv channel, right?